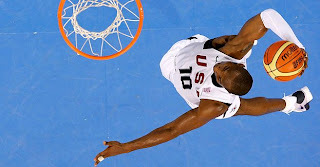 Redeem Team Opens Olympics With Bang ~ The Bucky Channel - The World of Sports from Wisconsin's Perspective. I've said it before, and I'll say it again. I love this USA Basketball team. It features some of the biggest basketball stars in the world, some key role-players, and our boy Michael Redd. They've practiced together, they like each other, they play well together. And the team that is out to redeem the USA's standing on the world basketball stage took the first step in doing so last night, with a 101-70 win over China. I tried to get up to watch the game, but ultimately I could only doze in and out, catching a few highlights. I was impressed with what I did see however, from the dunking display of the Americans, to the enthusiam of the Chinese fans. For the stat junkies out there, Dwayne Wade lead the U.S. with 19 points, followed by LeBron James with 18. Michael Redd played 13 minutes and had 9 points. For China, Yao Ming led with 13 points, and Yi Jianlian was a disappointing 4 for 13 from the field with 9 points. Whether in attendance or over the airwaves, it's estimated that one billion people watched some part of the game. That's like 1/6th of the entire world, all with their eyes on a single sporting event. From what I did see, it certainly did seem like a game on a whole different level, and it was a great way to start the "Redeem Team's" quest for the Gold. Elsewhere on the Olympic stage, the U.S. Men's Soccer team had victory escape from them when the Dutch scored in the game's final minute. They left the field disappointed with a 2-2 result. A win would have advanced them into the next round, now they will need to earn a tie vs. Nigeria on Wednesday to move on.